This tutorial focuses on visualization and analysis of molecular dynamics (MD) trajectories and other structural ensembles with the MD Movie tool. 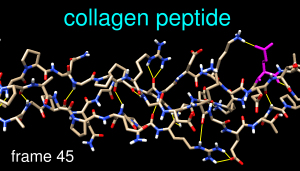 Part 1 uses an MD trajectory of a collagen peptide, and Part 2 uses an NMR ensemble of Met-enkephalin. 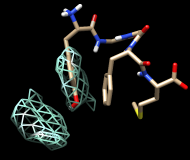 Severity of osteogenesis imperfecta and structure of a collagen-like peptide modeling a lethal mutation site. Radmer RJ, Klein TE. Biochemistry. 2004 May 11;43(18):5314-23. Once the inputs have been specified, click OK. The first set of coordinates will be displayed and the MD Movie controller will appear. If the controller becomes obscured by other windows, it can be raised using its instance in the Tools menu (near the bottom of the menu, below the horizontal line). Move and scale the structure as desired throughout the tutorial. The structure contains three chains. Each chain is in a left-handed polyproline II helix conformation, and together the chains form the right-handed triple helix characteristic of fibrillar collagen. 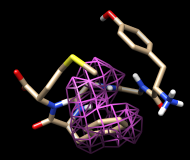 The ribbons are narrow like spaghetti because the peptides are not in a standard α-helix or β-strand conformation. Use the MD Movie controller to play the trajectory. From left to right, the buttons mean: play backward continuously; go back one step; stop; go forward one step; and play forward continuously. The rate of continuous play can be adjusted with the Playback speed slider. The Frame number is reported and can also be entered directly to view a specific frame. Frame number and Step size changes take effect when return (Enter) is pressed. Quit from the sequence panel. Even though it is no longer selected, residue 86 will be held steady during playback (as possible; there will still be internal motions) until Hold selection steady with a different selection or Stop holding steady is used. The structure can still be moved with the mouse, however. Try playing the trajectory with residue 86 held steady and then without holding any atoms steady (from the controller menu, choose Actions... Stop holding steady). We will create a short movie of several frames in the trajectory. The following procedure is just one example; there are many possibilities of what to show, how to show it, whether to use a script, and so on. Use 2D Labels (Tools... Utilities... 2D Labels) to add a title. When Use mouse for label placement is checked, the left mouse button (button 1) is reassigned to labeling: clicking starts a new 2D label and previously created 2D labels can be repositioned by dragging. Click in the Chimera window where you would like to start a title and type in the title text; drag the text if you want to reposition it. Adjust the Font size, Font style, and Color (click the color well, use the Color Editor) to your liking. Unchecking Use mouse for label placement returns the left mouse button to its previous function (by default, rotation). This label will be used to display the frame number. In the 2D Labels dialog, make sure that Use mouse for label placement is checked, then drag the temporary text to near the lower left corner of the Chimera window. Adjust the settings of that label to your liking, then Close the 2D Labels dialog. 2dlabels change mylabel text "frame <FRAME>"
Frames 1-25 will then be played, saved as images, and automatically assembled into a movie file. View the resulting 1-second movie with the appropriate application on your computer. A multidimensional 1H NMR investigation of the conformation of methionine-enkephalin in fast-tumbling bicelles. Marcotte I, Separovic F, Auger M, Gagné SM. Biophys J. 2004 Mar;86(3):1587-600. To follow along, download the data file 1plx.pdb. With Chimera started and the Command Line shown (as in Part 1), choose Tools... MD/Ensemble Analysis... MD Movie. 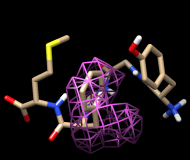 In the resulting dialog, choose PDB as the Trajectory format and indicate that the frames are contained in a single file. Browse to the file 1plx.pdb, set the input location, and then click OK. The first set of coordinates will be displayed and the MD Movie controller will appear. If the controller becomes obscured by other windows, it can be raised using its instance in the Tools menu (near the bottom of the menu, below the horizontal line). (The structure may have been shown that way already, depending on your preference settings.) Only the polar hydrogens are shown; hydrogens on carbons are present but undisplayed. Move and scale the structure as desired throughout the tutorial. 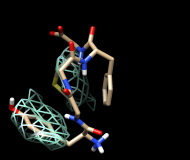 This structure is Met-enkephalin, with the sequence Tyr-Gly-Gly-Phe-Met. Enkephalins are neuropeptides that activate opioid receptors. Different subtypes of opioid receptors mediate different but overlapping responses in the body. For example, molecules that selectively activate μ-opioid receptors are more effective for treating severe pain than molecules that selectively activate δ-opioid receptors, but are also more likely to cause constipation. The conformations of molecules that bind opioid receptors (enkephalins, morphine, etc.) are of interest because they influence the selectivity of receptor binding and thus the physiological response. Use the MD Movie controller to flip through the different conformations, as described above. The frames do not reflect time ordering, as this is an NMR ensemble rather than a trajectory. It is thought (see the reference) that a conformation of enkephalin in which the Tyr and Phe rings point in different directions (like frames 1 and 25) binds to μ-opioid receptors, and a conformation in which they point in roughly the same direction (like frames 2 and 80) binds to δ-opioid receptors. 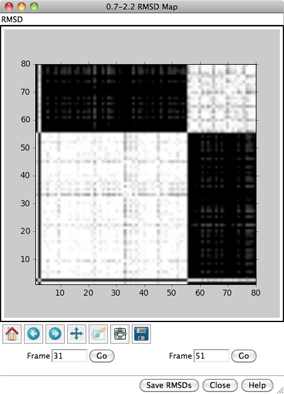 One way to analyze the ensemble is to calculate root-mean-square deviations (RMSDs) between pairs of frames. From the controller menu, choose Analysis... RMSD map. Click Apply on the RMSD parameters dialog to perform the calculation without closing the dialog. This will compute all pairwise RMSDs between frames and show the result as a map in grayscale. After the initial calculation, the map will be recolored to enhance contrast. In the RMSD map, the axes are frame numbers; lighter squares reflect pairs of frames with lower RMSDs (more similar structures) and darker squares reflect pairs of frames with higher RMSDs (less similar structures). Mousing over the map shows the RMSD values and the numbers of the frames being compared. Clicking on the map enters the corresponding pair of Frame numbers below the map. Clicking Go then displays that frame in the main Chimera window. Roughly, the lower left block of white in the map represents conformations more similar to to a μ-binding conformation, and the upper right block of white represents conformations more similar to a δ-binding conformation. Similar conformations are mostly grouped together in this ensemble, but will not necessarily be grouped together in ensembles in general. Also, ensembles usually contain many more groups of conformations, especially for larger structures with more degrees of freedom. and this time click OK to dismiss the RMSD parameters dialog and perform the calculation. Although the two maps span different ranges in RMSD, they reveal essentially the same groups of conformations. Close both maps. Another way to analyze the ensemble is to calculate spatial occupancy maps for atoms of interest. From the controller menu, choose Analysis... Calculate occupancy. The resulting dialog will show the warning message “No atoms being held steady.” This means you have not previously selected a set of atoms and chosen Actions... Hold selection steady from the controller menu for this ensemble. Why might it be useful to hold atoms steady while calculating occupancy? The contents of different frames may move around enough to obscure certain spatial patterns. Even if the structure as a whole is held fairly steady, one may want to hold a particular set of atoms (such as a sidechain) steady to examine local interactions. However, if the structure or region of interest is already sufficiently steady, the “hold steady” step can be omitted. Choose Actions... Hold selection steady from the controller menu. If the occupancy dialog is not already up, choose Analysis... Calculate occupancy from the controller menu. Click OK on the occupancy dialog. When the map has been computed, the Volume Viewer tool will appear. This tool shows a histogram of the values in the map; the slider controls what contour level is displayed. Clear the selection in Chimera (Select... Clear Selection). In the Volume Viewer tool, change the Style from surface to mesh and move the slider to a Level of approximately 2. Optionally, change the color of the mesh surface by clicking the color well below the histogram and using the Color Editor. You will see two main blobs or volumes representing probable positions of the Tyr ring relative to the Phe ring, similar to the upper set of images at right. The larger volume represents μ-type conformations and the smaller represents δ-type conformations. For the images, the mesh lines were smoothed and their thickness increased. This can be done by choosing Features... Surface and Mesh options from the Volume Viewer menu and using the resulting settings in the dialog (see the Volume Viewer documentation for details on its many features), or by using the volume command. If desired, flip through the ensemble (still holding the Phe ring steady) to verify that the volumes show areas occupied by the Tyr ring. To delete the volume display, choose File... Close map from the Volume Viewer menu. Finally, calculate a map without holding any atoms steady. Choose Actions... Stop holding steady from the controller menu. Since this ensemble maintains the Tyr ring in roughly the same place, simply map the occupancy of the Phe ring atoms. Select the Phe ring atoms (as above), choose Analysis... Calculate occupancy, and click OK. This time, the conformations are not as well separated; two lobes of occupancy are apparent at a contour level of approximately 2, similar to the lower set of images. One lobe represents μ-type conformations and the other represents δ-type conformations. When finished with the Met-enkephalin ensemble, quit from Chimera (File... Quit).